Global warming from increasing greenhouse gas concentrations is a significant driver of both increases in ocean mass and ocean thermal expansion as components of recent and future sea level rise. From 1955 to 1995, earlier estimates of ocean thermal expansion is estimated to have contributed about 0.4 mm/year to sea level rise, less than 25 per cent of the observed rise over the same period. For the 1993 to 2003 decade, when the best data are available, thermal expansion was estimated to be significantly larger, at about 1.6 mm/year for the upper 750 m of the ocean alone, about 50 per cent of the observed sea level rise of 3.1 mm/year. Over the last few years we have been working hard on providing improved estimates of ocean thermal expansion. Dyurgerov and Meier glacier estimate. 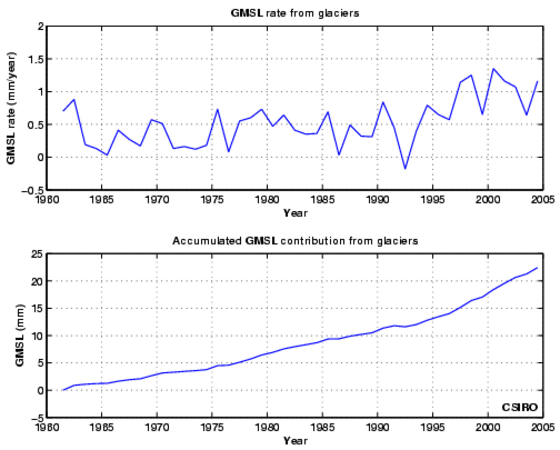 The figure below shows the time series of glacier contributions to global sea level (top panel) and the cumulative effect (bottom panel) from 1961-2004. The ice sheets of Greenland and Antarctica have the potential to make the largest contribution to sea level rise, but they are also the greatest source of uncertainty. Since 1990 there has been increased snow accumulation at high elevation on the Greenland ice sheet, while at lower elevation there has been more widespread surface melting and a significant increase in the flow of outlet glaciers. The net result is a decrease in the mass of the Greenland ice sheet - a positive contribution to sea level rise. For the Antarctic Ice Sheet, the uncertainty is greater. There are insufficient data to make direct estimates for the preceding decades. 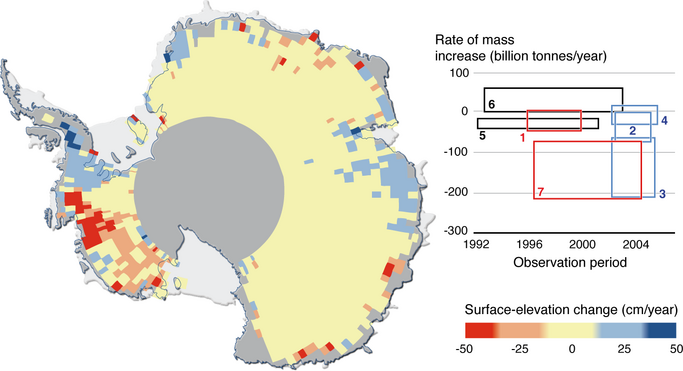 At present, the mass gain of the Antarctic Ice Sheet due to increased thickening of the East Antarctic Ice Sheet does not appear to compensate for the mass loss due to the increased glacier flow on the Antarctic Peninsula and the West Antarctic Ice Sheet. Modelling studies suggest that the Antarctic Ice Sheet is still responding to changes since the last ice age and that this may also be contributing to sea level rise.